Our Crushpad System is designed for wineries where there is a certain amount of respect for the fruit. Your equipment should respect your fruit and enable you to deliver an expression of place and varietal character which is unique to that fruit. A Crush Equipment Package is not a list of machines on an invoice. It's a group of wine grape processing tools designed by one entity to form a cohesive team of crush equipment which preserves overall wine quality and decreases labor through efficiency and ease of cleaning. If you could work less, do more, and go home earlier during harvest, wouldn't you? It all starts with a Hopper. 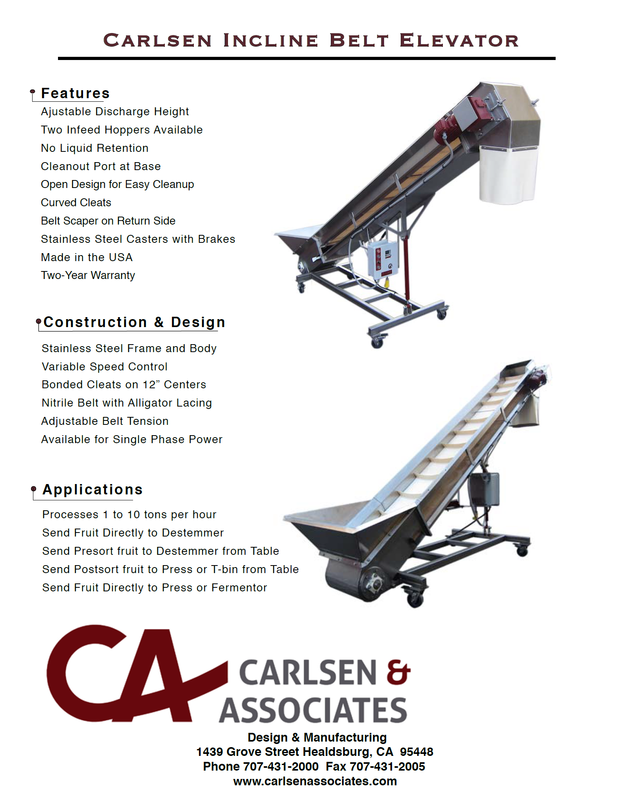 The first piece of crush equipment your grapes should see: The Carlsen 6' horizontal receiving hopper. Adjustable from 65 to 105" discharge height and designed for dumping half- ton bins into on the fly, the Carlsen 6- Foot Horizontal Receiving Hopper is the key to best results from your destemmer. Supplying a constant, metered feed of fruit into the destemmer means that you can dial in the perfect internal rotation speed to get the best possible result. This also comes in handy when feeding the press either whole cluster fruit or fermented reds dumped from bins. Height adjustments are made easily with your forklift for use in any scenario. There is much controversy lately over what method of fruit receiving to use. The concern is that an auger will somehow harm the fruit. While the typical auger is less gentle than a gloved hand, our Carlsen receiving hopper's horizontal auger is flight- edged and over sized to eliminate pressure on the bunches and maceration of the fruit. There is no pinch zone between the hopper floor and the screw. There is no end bearing to create a stem knot. 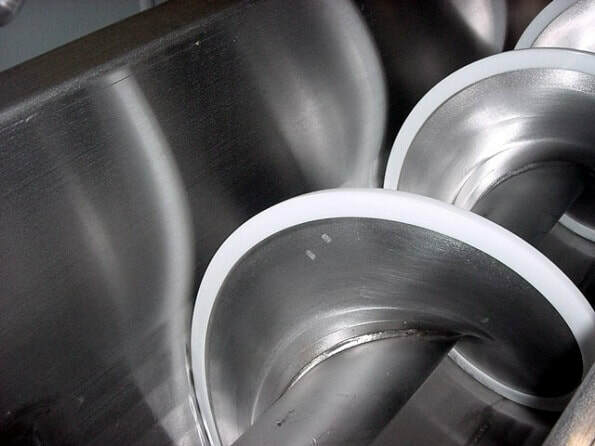 There is negligible, if any increase in solids using this hopper. The energy used to move the fruit is not wasted, as the bunches slide easily on the polished stainless interior of the hopper. This design is more gentle than hand- raking fruit out of a bin, into the destemmer. And is much more efficient and effective than dumping lugs into a destemmer by hand. Site- specific challenges are easier to tackle with the right machines. 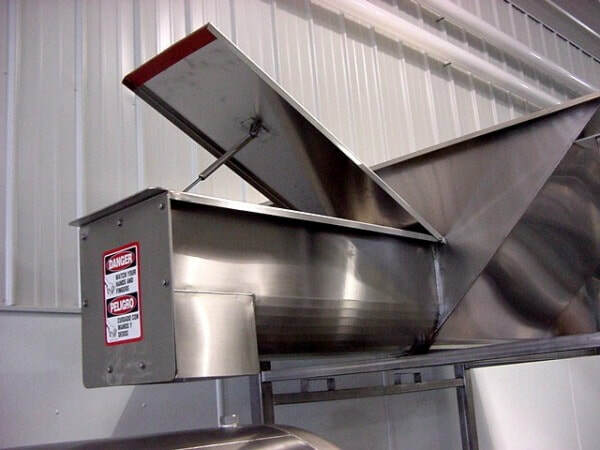 The hood on the 6' horizontal receiving hopper opens for cleaning or inspection. The shaft has no seams and is flight edged to keep from harming fruit and eliminate the need for an end bearing. Maybe you like the Carlsen Belt Incline Elevator better? 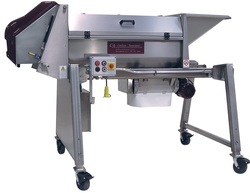 This type of Receiving Hopper is used when fruit must be raked into the process when feeding a destemmer. 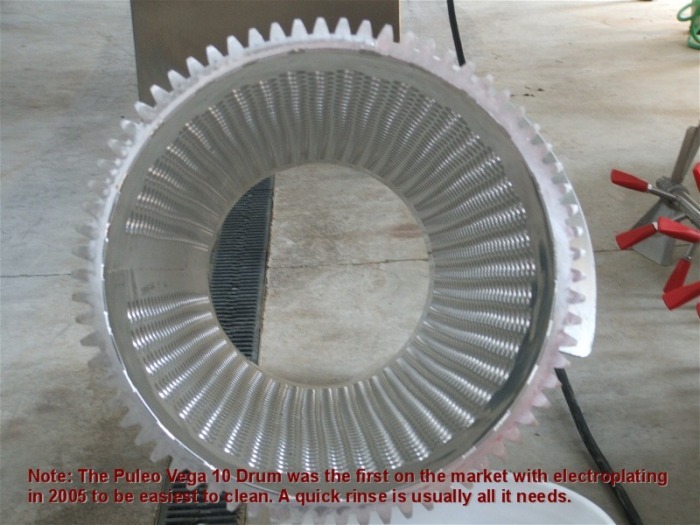 All parts available off the shelf in the U.S.
A household name in crush equipment, our Puleo Vega series destemmers are rated in maximum tons per hour. Some of the best winery equipment you can buy, this popular machine is one of the quietest, most durable, and most versatile pieces of crush equipment on the market. This destemmer is frequency controlled to lower the number of mechanical parts. With this destemmer, you will have the option to crush, de- stem, or both at the same time. This works with all types of grapes and can be sized for very large or very small varieties of grapes. Our speed control is a frequency drive. What this means to the user is that our machine does not rely on a knob with a pulley and a belt to control speed. This is an especially important point as the aforementioned configuration wears out; whereas a frequency controller does not endure physical wear. Furthermore, our electronics allow you to find that perfect speed of throughput from zero to maximum in any size destemmer that we sell. Our crush rollers are easily adjusted or taken out of service in seconds. The waste from the destemmer is easy to collect in 1/2 ton macro bins. 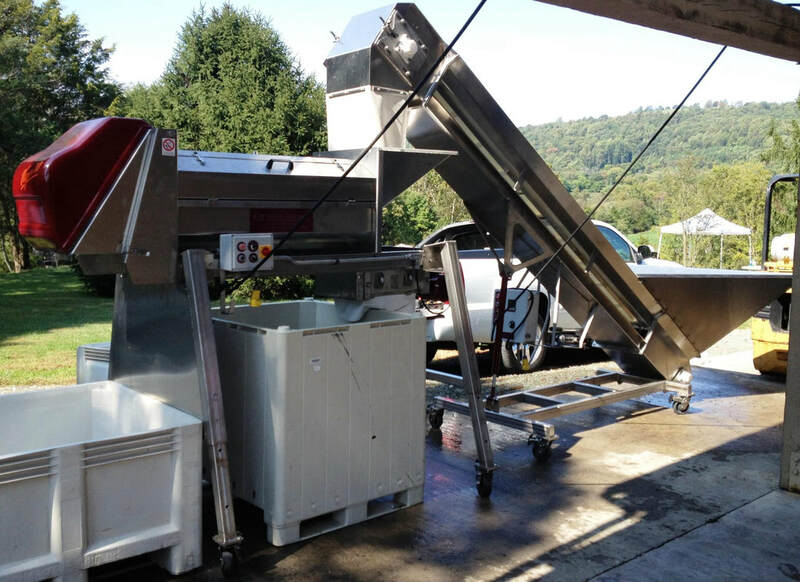 The Puleo Vega series of destemmer/ crusher is available in a range of sizes that cover production from 1 to 80 tons per hour, enabling your winery to process at the speed and quality level you need during harvest. The size is relative to full- capacity throughput. This is not to say that you cannot run 1 or 2 tons per hour through a 10 ton per destemmer. 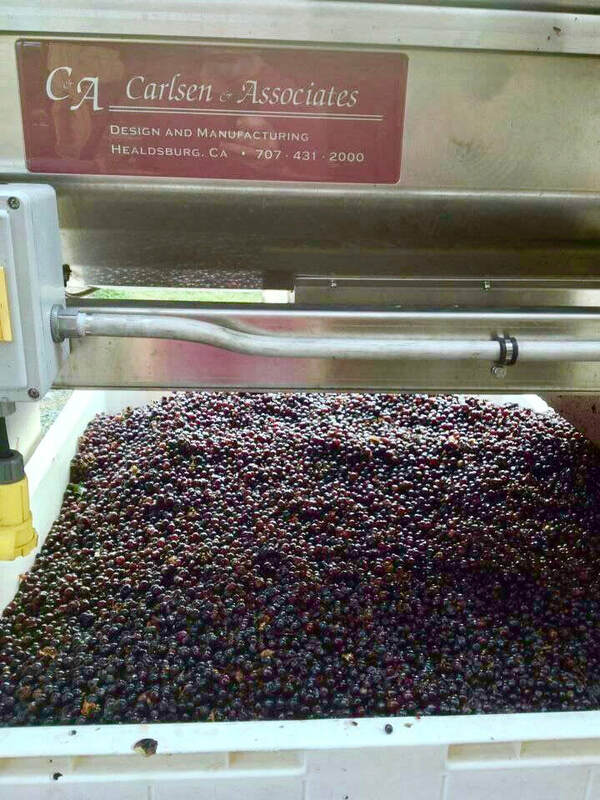 The speed of the destemmer/ crusher is adjusted for the size of the berries, cluster tightness, degree of ripeness or rot, and the amount of jacks or stem material you see in the product. Destemmer Crusher capacity is not relevant to speed as much as it is rate of feeding. Charlottesville, Virginia Merlot fruit after our Puleo Vega 10 destemmer from Carlsen & Associates. The basket is available in two sizes and is 100% hand ground, polished, and electro- plated for a gentler process and easier cleaning. CIP equipped destemmer makes days shorter during harvest! 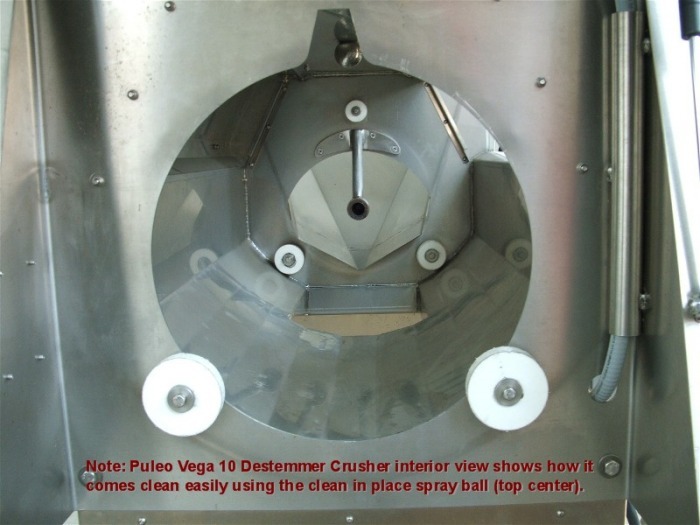 The spray ball inside the Vega series of destemmers makes cleaning a breeze. Must Sump couples with the Waukesha to turn it into a must- pumping system. The gentlest and strongest pump in the WORLD. These two items make up the Carlsen must pump system. These machines work together to comprise the most gentle mechanized means of moving crushed and / or destemmed wine grapes to a press or fermenter. Half of this system sits idle for a portion of the year while the other half is earning its keep year 'round. Crush equipment which is used after crush is worth twice as much as what it costs. 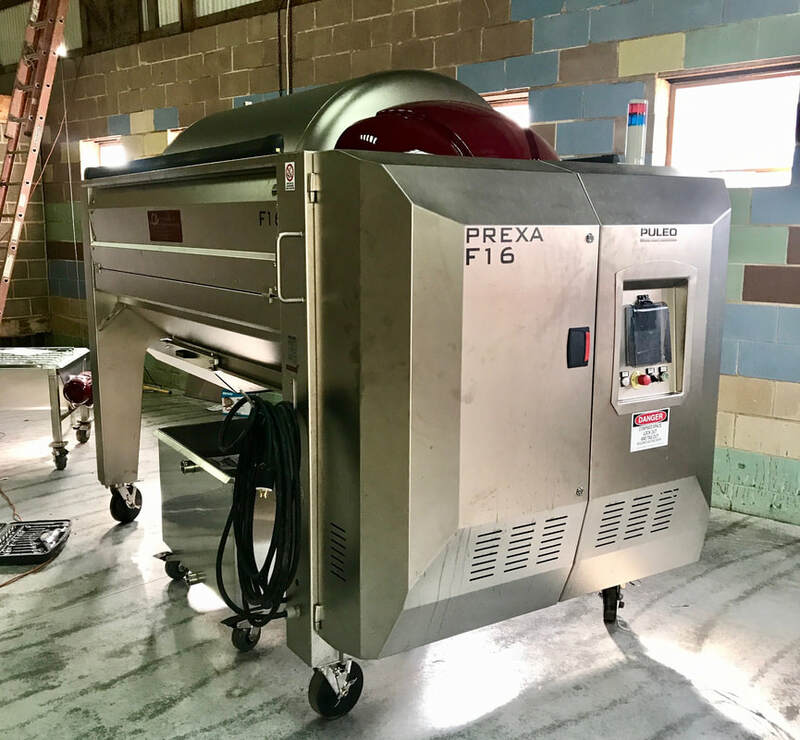 Waukesha owners say that the Waukesha quickly becomes the preferred pump for wine transfers, pumpovers, racking, bottling, and barrel topping with its optional pressure controlled switch and barrel topping wand add- ons. This pump will be the work- horse of the winery enabling you to pump must and do your other sorts of work with the strongest, yet gentlest wine or must pump in the industry. To quote Chris Wirth, "The Waukesha is the only pump in the industry that does not degrade overall wine quality." If lower dissolved oxygen, the ability to self prime, and no fear of short periods of dry operation sound good to you, we should talk. We have the professionally tested numbers to prove that this must pump system offers the lowest solids, highest number of whole berries and lowest number of broken seeds of any mechanized method for transporting must in the wine industry. Every winery needs a second pump. With this pump first in the batting order, pump #2 can be much less powerful and thus less costly. The most pressing issue? Let's go to Press. "A press is a press" , says Jim Carlsen, founder of Carlsen & Associates. Our competitors would have you believe otherwise. Don't over pay for a press that is partially constructed from mild steel or includes a very complex system for lengthening your day. Crush equipment needs to work once a year. It's like pulling a car out of the barn and driving 3000 miles at full speed. Can yours do that? The press is arguably the biggest money maker of the crush equipment world. What else can you point to and see the liquid gold coming out of during use? It also has the least to do with overall wine quality; Unless it breaks. Your press will pay for itself again and again before it retires. They are designed and built this way to cover your, um.. bases on how to control it should the need for an alternate means to control the machine arise. Our service sells our press. The decision on closed tank, open tank, or basket is yours. How would you like to know that you bought the press with the most American labor and the most domestically available parts? Our basket press is 100% American made. Our bladder presses have thirteen years of being built our way built- in. And all of our presses come with the screened press pan (which doubles as a pump-over sump) included and are already at bin- height on the bottom when they arrive. There is no extra charge for the pan or the legs. We sell you what you expect in a press. Of course we all contend that ours are better. There is simply no magic, no voodoo, no divine intervention or luck in a wine press. You will be trained on your new press and you will be comfortable with our warranty, service, and your level of knowledge about our machine. You will be able to have it do whatever you ask it to. A winemaker will encounter pressing situations where they must be a little gentler, a little more patient, or more aggressive and you will know exactly how to do that after Carlsen and ENOTOOLS finish your training. Another part of our training shows you how to use very little water getting your press clean. Whatever the size or type press you need, Carlsen and ENOTOOLS are happy to include it in a Crushpad Package. Read more on presses here. Need a few references for why you should buy your winery crushpad equipment from us? Still not sure? Maybe you should read our write-up on How to Buy Winery Equipment.